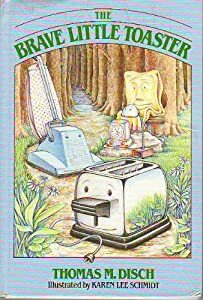 The Brave Little Toaster is the story of five appliances–a toaster, a Tensor lamp, a Hoover vacuum cleaner, an electric blanket, and a alarm clock/radio–that leave their home, a cabin in the woods, in search of their master’s city home. They show all sorts of ingenuity and teamwork in order to finally reach his home, and they meet a few characters along the way. Although they don’t exactly get what they set out for, the story does have a happy ending. And what a long and weary way it was! The forest stretched on seemingly forever with the most monotonous predictability, each tree just like the next–trunk, branches, leaves; trunk, branches, leaves. Of course a tree would’ve taken a different view of the matter. We all tend to see the way others are alike and how we differ, and it’s probably just as well that we do, since that prevents a great deal of confusion. But perhaps we should remind ourselves from time to time that ours is a very partial view, and that the world is full of a great deal more variety than we ever manage to take in. An original1980 publication date makes the characters in this story foreign to today’s child, I would guess, so there’s also the fun little walk down memory lane it forces its reader to take. Really, there’s much to commend this short story, especially if you’re looking for a short, light read, as I was. I know there’s an animated movie that was made from this book which I thought would be fun to show the girls, but alas, I’ve been unable to locate it. I’ve found a couple of sequels, but not the original. Maybe someday we’ll run across it. What’s in your read aloud basket this week? Please, share in the comments, or leave a link to your own RAT post in the comments. I had no idea this was originally a book — I’ve heard of the movie, though I don’t think I’ve ever seen it. I completely forgot about this book…but I remember it from my childhood. I’ll have to check it out for a fun walk down memory lane! Yup! I watched the movie when it first came out. And then I found out it was based on a book and I couldn’t believe it. I think Disney could have chosen a more interesting story but ….whatever. Laughing at Beth’s comment about being traumatized by it. The ONLY reason I want to read the book is because Disney made a film on it and I’m curious. I remember watching this with my niece when she was a baby about 15 years ago and not being overly impressed with the movie. Now I feel like I kinda need to give the book a chance!